This is what you should know if you are taking this type of blood pressure drug – ACE inhibitors. The simple act of having a healthy snack can become dangerous due to a strange allergy risk that is newly discovered among one of the most widely prescribed high blood pressure medications, according to a new study. Tingling, swelling, and itching in a most unfortunate place can erupt after the use of this popular blood pressure drug, prescribed to millions worldwide for ‘controlling’ blood pressure. High blood pressure is the most common illness in the world, according to the World Health Organization. It stands to reason that the medications used to treat the condition, then, would be among the most frequently prescribed as well. Research from IMS Health projects that this popular blood pressure drug -ACE Inhibitor Lisinopril is among the top 5 most commonly prescribed medications. ACE inhibitors have a number of reactions in the body. Some of the reactions do bring down blood pressure, but other reactions are the source of the very long list of known side effects. Alarmingly, though, some side effects of this commonly used blood pressure drug are still being uncovered. In research presented recently at the American College of Allergy, Asthma and Immunology, people who take ACE Inhibitors are at much higher risk of developing severe allergic reactions to otherwise benign stimuli. Even for people who have been on the medications for a long period of time, side effects can crop up out of nowhere. People who already have mild allergies or are predisposed to certain conditions are at much greater risk of developing problems, and they can be much more severe. For example, a condition known as oral allergy syndrome, in which the body confuses certain proteins in foods as foreign allergens, is typically just a nuisance. 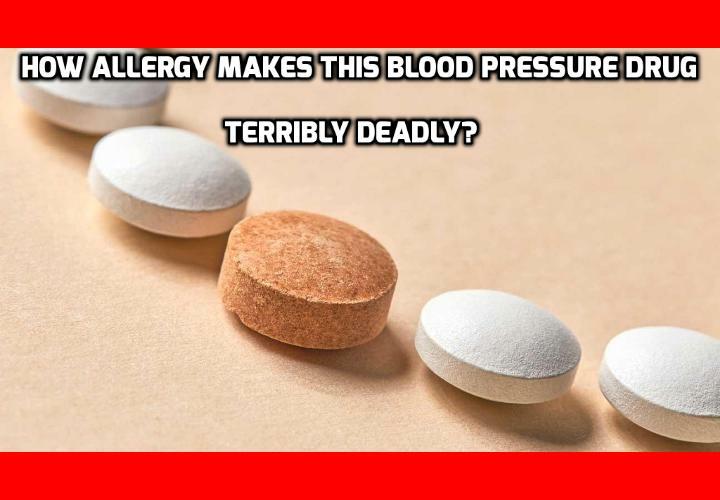 However, when this condition occurs in people who are taking ACE Inhibitors, the allergic response can be as severe as an anaphylactic reaction, requiring emergency treatment. And the reaction can develop completely out of the blue, even in people who have been taking the blood pressure drug for years. Watch this Video – High blood pressure meds. Lisinopril and its side effects. Is Tea Tree Oil Great for Treating Angular Cheilitis ? How to Reduce Risk of Heart Attack and High Blood Pressure? Next PostNext What Makes this Worst Unknown High Blood Pressure Cause?